African American transparent makeup is makeup that will give you a natural looking appearance. Ladies who wear transparent makeup have a natural glow, and they do not look as though they are made up. The key to finding and using transparent makeup is selecting makeup that is a perfect match for your complexion. Typically, foundations that are water-based are more transparent than foundations that are made with oils. Use a dab of concealer to cover blemishes, but do not try to cover every imperfection. Too much concealer can diminish your efforts for creating a natural transparent look. Everyone has blemishes. When you are wearing transparent makeup, you should look as though you naturally have clear skin. You should not look made up. Therefore, it's okay if you do not cover every blemish. Choose tinted moisturizers over other coverage options. Tinted moisturizers are merely moisturizers with a bit of color. It is important to test foundations in bright light, so that the moisturizer will not appear to be ashy on your skin. Prescriptives Makeup Line has makeup that will perfectly match your complexion because it is mixed especially for you. The line also has tinted moisturizers. They are not individually formulated, but you can test them out. Here's how to test the product. Take a pea-sized amount of the product and rub it completely into your skin. Look at the product from all angles in a mirror. Ask a makeup associate or a close friend for help to determine if the product can be seen. Can't find transparent makeup foundation that you like? Make your own. Make your own transparent foundation by taking your favorite moisturizer and mixing a dab of your favorite foundation with it. Your mixture should consist primarily of moisturizer. Use a clear mascara, that is mascara without any color added to lengthen your lashes. You can also simply add one coat of your favorite mascara that does not clump. Forgo using black liner for a completely transparent look, and use a liner that matches your skin tone if you desire. You can either skip the eye shadow or use a bronzer over your eyes. Bronzers add a subtle glow to your skin, and some even have a sparkling or shimmer finish. 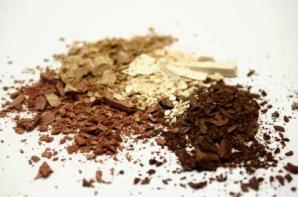 If you don't want to eliminate your shadow or use a bronzer, try using shadows in earth tone shades that blend into your complexion. Look for pallets with shades of brown. Lip glosses with barely any color or a hint of pink or beige are your best bets when it comes to transparent lips. Test the glosses, because some that appear to be rich in color are actually transparent. Keep your gloss with you because they rub off easily. Use a transparent powder to set the makeup on your face. Typically, these powders appear to be white, but they slide on with no color. Try using Makeup Forever's High Definition Powder as a finish. The powder is formulated to help models and people in the entertainment community have a smooth, flawless completion even in today's high definition world. The particles in this powder are so small that it goes on like dust and it sinks into the skin leaving no color. It leaves your skin smooth and diminishes pores while looking completely natural. When searching for African American transparent makeup, remember that the key is to search for makeup that looks natural by blending seamlessly into your own complexion. Use small amounts of your own makeup, blended with moisturizers. Use minimal eye makeup, and finish your look off with a translucent powder. Dab on some lip gloss and head out the door for your a look that is nearly natural!